The year that Christopher Columbus crossed the Atlantic and Isabel and Ferdinand expelled the Jews from Spain, an unheralded event took place. A cartographer in Lisbon, Portugal, drew an amazing map detailing the coasts of Europe, the Mediterranean, the Black Sea, and western Africa. The map reflected an explosion of knowledge of the known world, liberating Europeans from the narrow confines of the Mediterranean and launching the era of seafaring empires. Just as Einstein’s theory of relativity changed the perception of the universe, the mapping of Africa had repercussions that would change civilization forever. The area the Lisbon map depicts is staggering. It spans more than 10 million square miles from 5 to 55 degrees north latitude and from 27 degrees present west to 41 degrees east longitude. At the top, Edinburgh’s Firth of Forth emerges, while to the south, the Volta River appears in eastern Ghana. On the west, the map displays the Azores, volcanic islands one-third of the way across the Atlantic and, on the east, Jerusalem and the shoreline of present-day Georgia in the Caucasus Mountains. Unlike previous rough outlines, the map marks a technical milestone with the rendering of its large coastline. Drawn entirely by hand and completed in 1492, the contours of this map are instantly identifiable. Placed atop a modern map of the same region, the level of accuracy is startling. Europe and Africa look the way they do on a contemporary map today. This sketch is arresting in another sense. 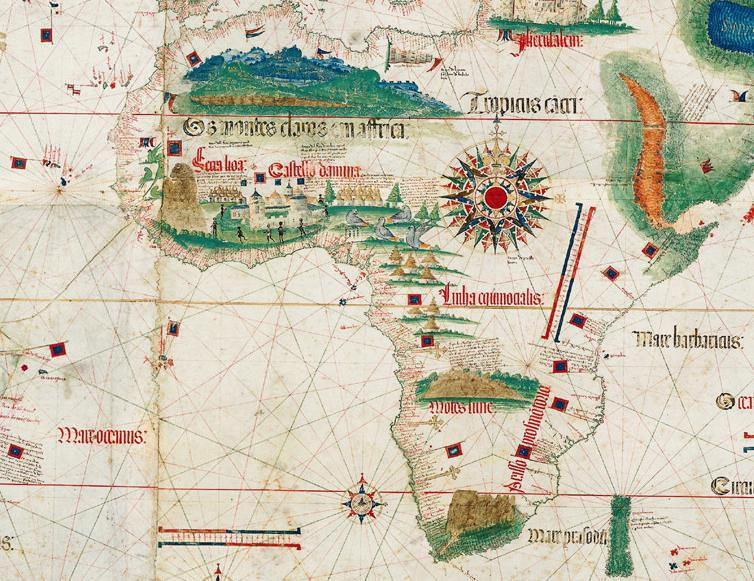 At the time, most European geographers were following the tradition from the first century C.E., drawing Portugal as a brick and North Africa as a block. But this Portuguese cartographer was sketching sinuous coastlines, undulating back and around in rococo patterns. How did the mapmakers’ usual world of straight lines, sharp angles, and the occasional perfectly symmetrical circle become transformed into these extravagantly baroque curves? And how did they come to reflect the shape of Europe and Africa so successfully?